The city of Liuyang is located in the Hunan Province in China. According to Liuyang’s traditions, thousands of years ago, during the Tang Dynasty, one of their Chinese monks invented the first official firecracker. His name was Li Tian, but he was not trying to come up with a great invention. As a believer in Taoism, he was only trying to drive away evil spirits. He had brainstormed that if he filled green bamboo shoots—like the ones used in Chinese celebrations—with an explosive black powder, they would make an even greater noise. He was right. There was a tremendous explosion because the black powder he used was the forerunner of gunpowder. We don’t have record of whether he felt he had succeeded in scaring away the evil spirits, but we do know that he created the first firecracker in the world. 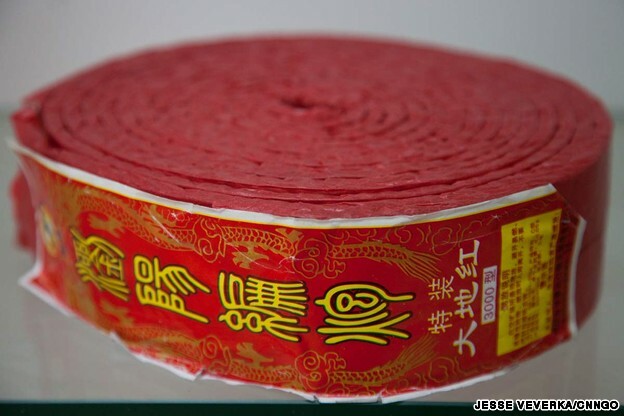 A roll of standard firecrackers, manufactured in China and sold worldwide. Throughout the years since, the Chinese people have perfected the monk’s simple firecracker. Today, fireworks are used in China to celebrate their new year, birthdays and many other special days, as well as around the world for national holidays and New Year’s celebrations. The city of Liuyang, in the meantime, built on this great invention and has become the fireworks capital of the world. This city supplies close to 60 percent of the revenue that China makes each year exporting pyrotechnic merchandise (fireworks). How can one city manufacture so many fireworks? 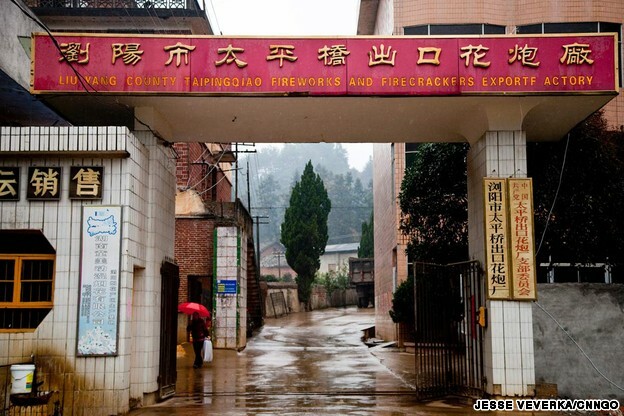 Liuyang has over a thousand factories directly involved in some aspect of making fireworks. Some of the factories manufacture firework components, such as black explosive powder, paper wrappers and fuses. Others manufacture the machinery and tools necessary to make these components. Still others handle the actual assembling of the fireworks. With its factories each set up to handle specific parts of the manufacturing process, Liuyang can produce fireworks in amazingly large quantities. The delicate assembly of the fireworks, though, is still done by hand by Chinese workers, most of whom are women. This provides skilled jobs for thousands of workers. It is also a high risk job because they are working with products that can possibly explode if they are not very careful. As dangerous as this job is, 60 percent of the workers in China help to manufacture fireworks in some way. The people of Liuyang are extremely proud that their city’s heritage is that it is the place where fireworks began. They promote that heritage through tourism. They even have a museum in the middle of Liuyang dedicated completely to the history of fireworks.